Do massive binary stars emit γ-rays ? Compelling evidence that massive binary stars are γ-ray emitters was found only for the strange system Eta Carina (Abdo et al. 2010). Very recently, γ-rays near the closest massive binary, WR 11, were reported by Pshirkov (2016) - right image. The Australia Telescope Online Archive (ATOA) helped to reveal a field with dozens of radio sources. Australia Telescope Compact Array (ATCA) data, taken during 2001 over 16 days, revealed other objects in the field which may contribute to the excess, like a probable radio galaxy (left image, and zoom). 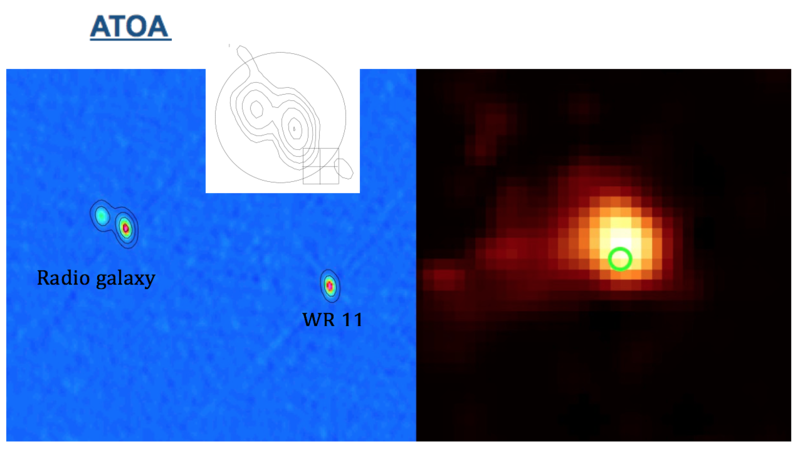 Right image: distribution of γ-ray excess emission measured with the Fermi LAT telescope; white pixels are slightly above six times the image noise; the green circle encompasses WR 11 but also the probable radio galxy. Left image: ATCA data showing radio continuum emission at 13 cm (2500 MHz) in color scale (from +-0.05 to 14 mJy/beam), superposed to contours of emission at 20 cm (1400 MHz) of 1, 5, 12 and 20 mJ/beam. Zoomed inset: emission contours at 13 cm at 0.3, 0.9, 3, 7, 18 and 25 mJy/beam.